1- Ereck Flowers- This guy has the prototypical body for a Left Tackle and is shooting up draft boards. The only reason I haven’t had him pegged as my #25 Pick in my Mock Drafts over at DraftTek is because for some reason he’s been available in the 2nd Rd. He’s had a couple of injury and maturity issues that may drop him to 25, but I really don’t see him available at 57. Flowers is 6’5, 320 lbs. and has long arms and quick feet. He can pull block, which the Panthers ask of their Tackles and really would be a steal at 25. He kind of reminds me of a more athletic DJ Fluker and could definitely play LT but may struggle early on. Even if he struggles early, he would be a Day 1 upgrade to Byron Bell. I wouldn’t mind seeing us resign Bell and move him back to RT and have depth there at the LT spot. To watch film on Flowers, click here. 2- Carl Davis- You may say: "DT!, really?" Well think about this, Dwan Edwards and Colin Cole are Free Agents and may not be back, and that leaves us with only two solid DTs and that is not enough. Davis shined at the Sr Bowl and demanded double teams all season long. He is a "Blue Goose," and is definitely worthy of the 25th pick. He has great size and body make up for a Panther DT. Stout and great use of hands. He always seems to be the first off the ball too. Not an elite pass-rusher but will clog the middle and solidify the run support. To watch film on Davis, click here. 3- Cameron Erving- There’s a lot to like about Cameron Erving: Big (6’6/310 lbs), athletic, and has a mean streak. He simply has to be consistent with his technique and he needs experience. Could start Day 1 at RT, but will need to be coached up on his technique. What makes him very appealing to me is his versatility. He can play any of the five positions on the line and has excelled at Center. So if the Panthers were to sign a King Dunlap or Mike Beluga in Free Agency, this Hog-Mollie could come in and start Day 1 at RT and provide unique depth across the line. The possibility of Ryan Kalil going down has kept me up at night in the past, and knowing that Erving could back him up would be great comfort to me and to Cam Newton. He has the real potential to be a very good LT one day too. To see film on Cameron Erving, click here. 4- Melvin Gordon- This is a guy that I selected in the DraftTek Mock. Many folks have asked why a running back? Well, it is clear to me that we really are not settled at the position. DW’s best days are way behind him and he most likely will not return. And just because Stewart was healthy for the last six games does not give me enough comfort to trust he will always be healthy. Plus he will be 28 next season which means he really has two seasons or so to carry the load. Melvin Gordon is a special player. He set a single game record with 408 yards in one game against a team that had only averaged giving up 116. Gordon explodes through the holes and having such a play maker would take the pressure off of Cam. To see film on Melvin Gordon, click here. 5- Kurtis Drummond- I really like what I see out of this Safety out of Michigan St. and would be the replacement for Roman Harper that is needed to take this Defense to the next level. Harper had some nice moments in 2014 but also struggled and looked slow at times. This position has to be addressed either in FA or the Draft and adding this young play maker would make a lot of sense to me. To see film on Kurtis Drummond, click here. Other names to look for are Sammie Coates, Michael Bennett and a surprise pick could be Leonard Floyd. 1- DeVante Parker- Oh I believe Panther Nation would love them some DeVante Parker. He is 6’3, 209 lbs and runs in the mid 4.4 range. Gets off the line well and has a huge catching radius. Still needs to develop as a route runner. That is why the next guy below is the one I would trade up for if given the choice. To see film on DeVante Parker, click here. 2- Kevin White- This kid really is who I want in this draft above anyone else. Rarely do you find a guy that has his size and speed and runs great routes. He had 109 receptions for 1447 yards and 10 TDs. He could be as good as OBJ and is bigger. If he is there at 15, Dave Gettleman would be working the phones. 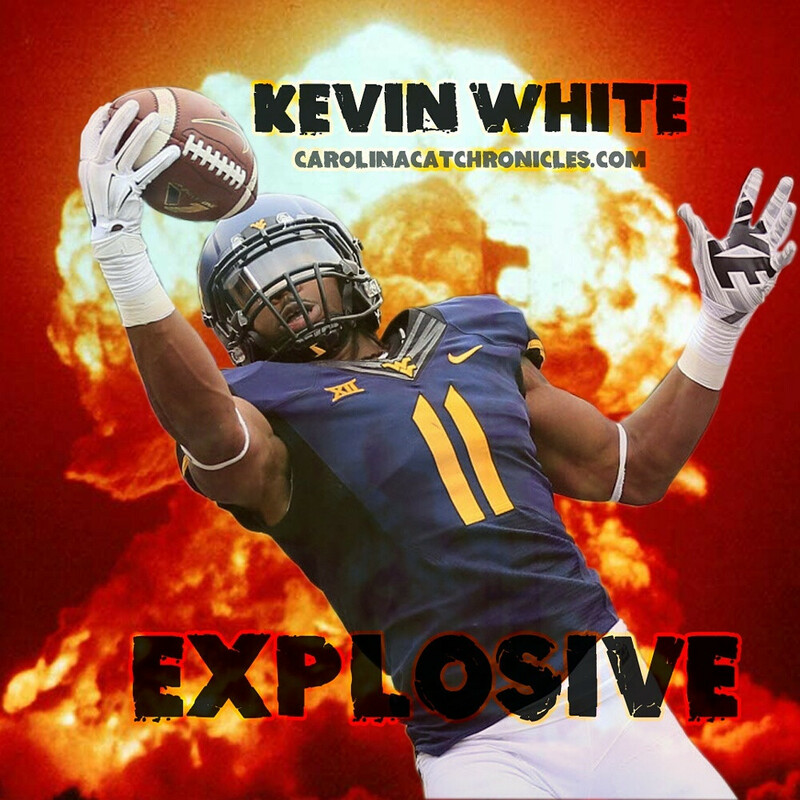 To see film on Kevin White, click here. Give me your thoughts Panther fans. Who do you want to see us take at Pick 25 and would you be willing to trade a third round pick for either Parker or White?